Beaducation: The Blog: Someone hand me the fire extinguisher!! Someone hand me the fire extinguisher!! ...'cause we had a couple of fires to put out! We had the best of intentions. "It's the 4th of July weekend," we thought. "We have these cute, new graphics, lots of letter sets and tools. Let's have a sale!" We prepare. We Blog. We Twitter. We Facebook. We send out the newsletter with the cute, new graphic announcing the sale. We check the site. Everything is a go. We imagine our customers shopping and getting excited about the tools and stamps. We push the refresh button on the computer to reload the homepage, just to check to see that the sale notice is up. And push, and push. Our server seems not to listen. Or our website to load. We can now imagine our customers cursing our very existence at the very same time we are cursing our server. Web guru Paul to the rescue. 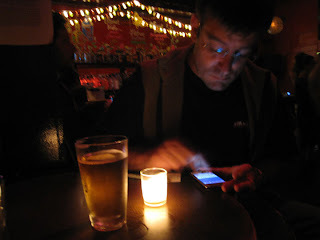 That is Paul on his night out on the town fixing our server by candlelight via IPhone (and with a helpful beer.) For those of you not in the know, Paul is our Lisa's genius hubby. Patient hubby. Clever-with-an-IPhone-hubby. Nice work, Paul. Thanks so much for your patience, folks, on this one. We are up and running (knock wood). Enjoy your stamps and tools. I am off to refill the fire extinguisher. Oh dear...so glad Lisa has a genius for a husband who is cleverly patient and great with an IPhone!!!!!! I managed to get my order in at 7:30am I'm assuming just before your ciaos!!!! !